The often-announced (on this site, anyway) Regulus occultation by asteroid (163) Erigone on the morning of March 20th was a near-wash (no rain, but plenty of cloud cover), with only a few messages being passed around at midnight to see if anyone was even going to try for 2:00 a.m. That said, the International Occultation Timing Association (IOTA) got lots of good press and, with luck, a similarly notable occultation will occur to catch other eyes and instigate the IOTA to prep another big public recording effort. Those who want to relive the non-event can watch the Slooh Community Observatory coverage in the youtube video below. 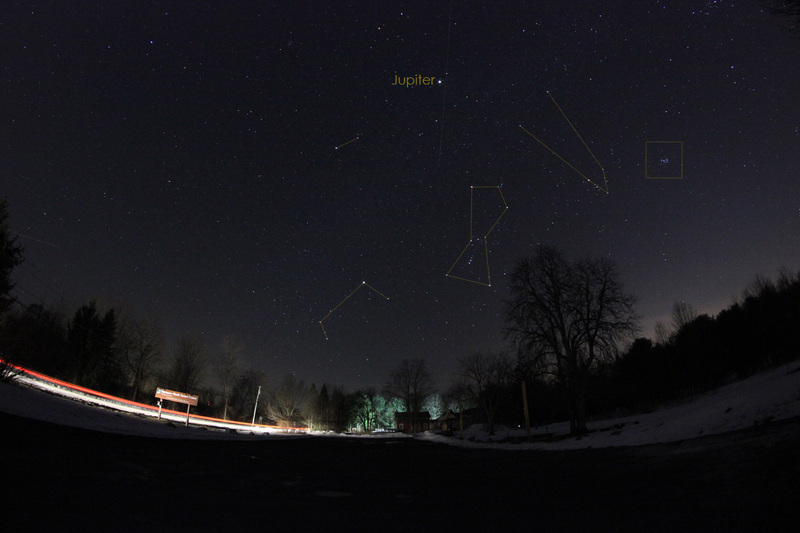 Then, two days later, Bob Piekiel with his Meade C11 and I with my New Moon Telescope 12.5″ Dob treated two couples at Baltimore Woods to the kind of crystal clear and steady skies you read out but usually never have the good fortune to be out for. With the late March and early April temperatures beginning to melt the high hills of ice and snow around all the big parking lots in the area, the Baltimore Woods setup was a bit solid, a bit slushy, and quite dirty. Our four-person audience arrived early in time to watch the clear skies darken and Jupiter, Sirius, and Betelgeuse first appear in the South/Southwest sky. For the next 90 minutes or so, the observing list included Jupiter (several times at several magnifications, both early in the evening and after the skies had sufficiently darkened to bring out more detail), the Pleiades (M45), the Beehive Cluster (M44), the Orion Nebula (M42), Alcor and Mizar in the handle of the Big Dipper, the Andromeda Galaxy (M31) and its prominent satellites (M32 and M110) very low on the horizon (very likely our last catches of our sister galaxy for several months to come), and even M82 to say that we had, at least, seen the location of the recent supernova (if not a last few photons from it). In an attempt to help someone remember as many constellations as possible at the Liverpool Public Library lecture a few weeks prior, I retold one of the more memorable tales of the winter star groupings of Orion the Hunter, Taurus the Bull, Canis Major (the big dog), Canis Minor (the little dog), and the Pleiades that I picked up from the excellent Dover book Star Lore: Myths, Legends, and Facts by William Tyler Olcott (which you can even read and download for free in an earlier form at archive.org). Long story short, the Pleiades (also known as the Seven Sisters or the Seven Virgins) were the target of Orion’s rather significant attention, so much so that in his last run to them, the ever-invasive Zeus placed an equally significant bull in Orion’s path, leaving Orion and his two dogs (Canis Major and Canis Minor) stuck in their tracks. 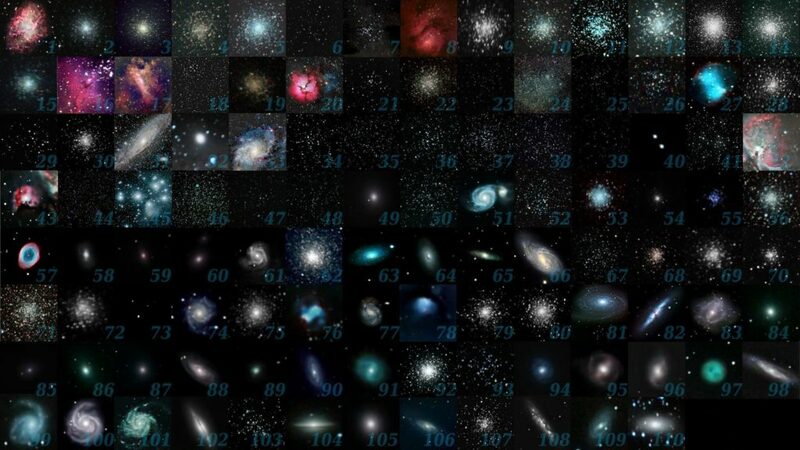 As is apparent from the images below, these four constellations (and one star cluster/Messier Object) are all tightly spaced in the Winter Sky. Better still, the end of Winter even finds these constellations standing on the horizon (instead of upside down in morning Autumn skies), making the picture all the more easily seen. 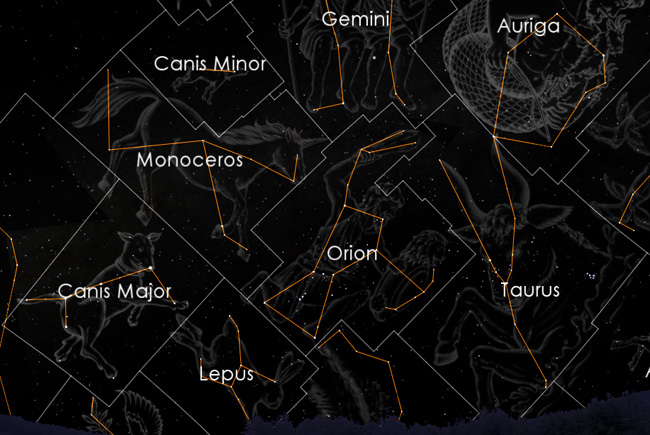 As Orion is second only to the Big Dipper in terms of ease-of-seeing by practically everyone (raised in the tradition of Western Constellation arrangements, anyway), it’s the start constellation from which to find the other three. 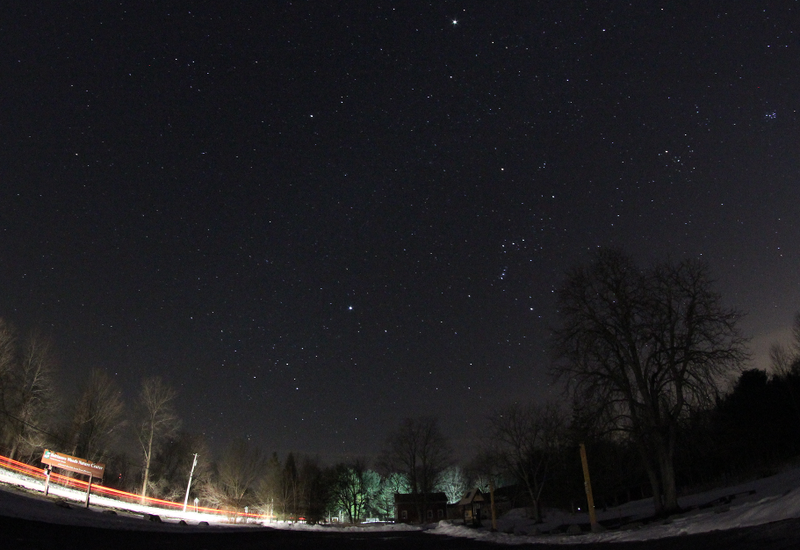 Canis Major is easily found by its shoulder star Sirius, the brightest start in our nighttime sky. 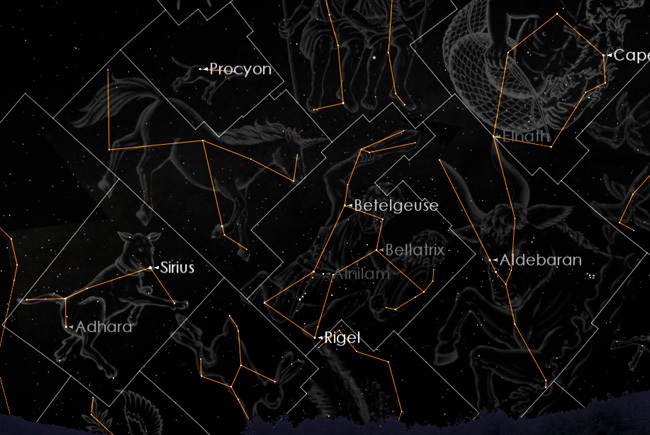 Canis Minor is a leap from Sirius to Procyon, also a prominent star. Taurus the Bull is easily found by its head, the local star cluster known as the Hyades, and its orange-red eye, Aldebaran. The small sisters lie within the boundary of Taurus in a cluster that to the slightly near-sighted might just look like a fuzzy patch (but which, in binoculars, reveals numerous tightly-packed stars). Our cast of characters (and nearest neighbors). Image made with Starry Night Pro. The prominent stars in their starring roles. Image made with Starry Night Pro. After packing up around 9:30 (about when the temperatures began to drop precipitously), I managed a single long-exposure image with my Canon T3i of the region above – quite possibly my last good look at the most famous Winter grouping until they appear again in the morning Autumn skies. Final scene from Baltimore Woods (with story labels). Click for a larger view.